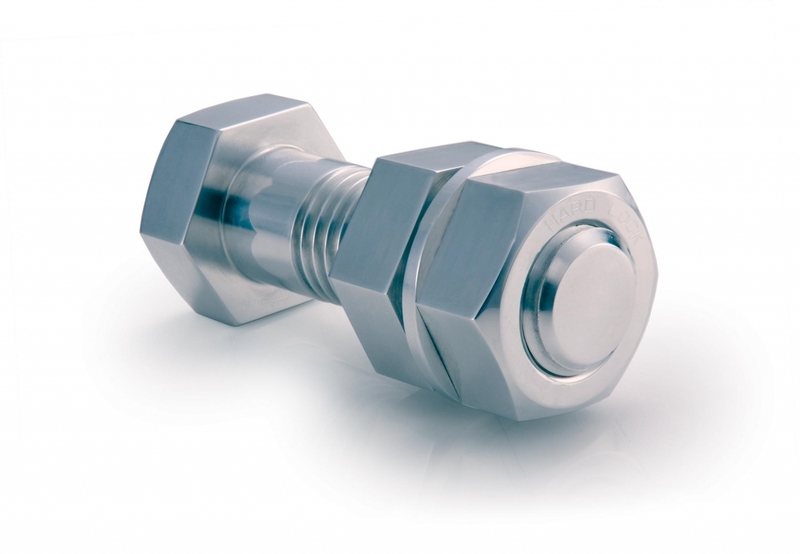 The HARDLOCK Nut resists loosening from vibration longer than any other fastener or locking nut on the market. A leading choice for engineers in Japan, America, the United Kingdom and Europe, the HARDLOCK Nut uses a unique wedge principle to create an unprecedented and powerful self-locking force. Download our multi-language HARDLOCK brochure here. 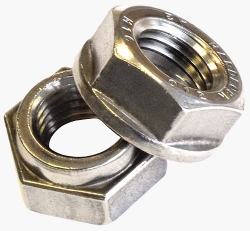 The HARDLOCK Nut utilizes the wedge principle to create a powerful self-locking force. Forcing a wedge into the gap between a cylinder and its surrounding tube makes it possible to create a powerfully locked assembly. Creating matching key grooves in both the nut and bolt, and then using a hammer to drive a wedge into those grooves does provide a powerful self-locking effect. However, this method is unsatisfactory from the standpoint of operability. The HARDLOCK solution is to use two nuts to play the roles of the hammer and wedge respectively. A small eccentricity in the sliding part of the convex top of the lower nut acts as the wedge. When the concave upper nut is tightened, the effect produced is exactly the same as that produced by a hammer driving in a wedge. 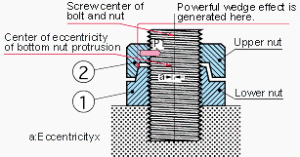 Moreover, it is much more effective to use a screw as this makes it very easy to force the wedge into place. After tightening the lower nut 1, install and tighten the upper nut 2 by hand. At this time, a gap G is created. This is a tightening margin used to provide the self-locking effect. 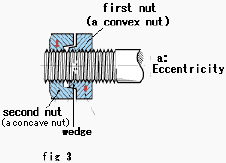 * During installation, installing the nuts in the opposite order to that shown above, i.e., installing concave nut 2 first and then tightening the convex nut 1, results in exactly the same self-locking effect. Tightening the upper nut 2 with a wrench generates torque, which allows the self-locking effect to be felt by hand. Make use of this feedback to set the torque value as required. At this time, the powerful self-locking effect is intrinsic, regardless of whether or not there are any gaps between the upper and lower nuts, so you can rest assured that the nut is securely tightened.